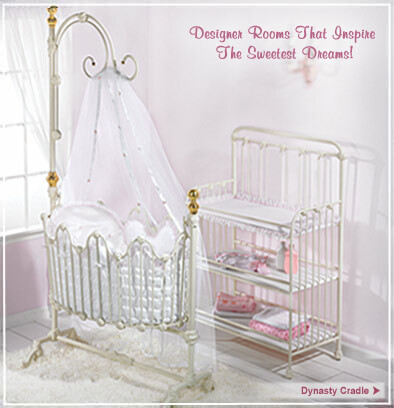 A Beautiful Crib can turn an ordinary room into a whimsical baby paradise. Our extensive baby crib collection includes round cribs, iron cribs, sleigh cribs, canopy cribs and hand painted cribs all with coordinating changing tables, armoires, dressers and more. To further enhance your nursery decor, add exclusive crib bedding, rocking gliders, artwork, rugs and lighting. Design the nursery of your dreams at Luxurylamb. Create a special space for your toddler to safely explore, dream and learn. Perfectly sized toddler beds and toddler bedding sets help ease the transition from crib to big girl/boy bed and are unsurpassed in quality, function and comfort. Child sized night tables, vanity tables, toy boxes, and tables and chair sets are perfect items to spark their unlimited imaginations and help make their room the most fun place in the house. Choose from our designer children’s room collections that bring spirit and distinction to your boy or girl’s most important retreat. Whether you favor a contemporary streamlined effect or sweet classic styling we’ve got children’s beds and furniture for you. Accent furniture including armoires, dresser, desks, and hutches in themes ranging from princess to the wild west are sure to inspire their imaginations and encourage dreams. Luxurylamb is company passionate in the belief that imagination and fun are the most essential part of baby and children’s furniture. Why must a bed just look like a bed, a chair just like a chair? Why shouldn’t it look like a castle, a pony or even a pirate ship? Why not furniture where a child can play, enter the realms of imagination, why not something where dreams do come true. Please join us for an exciting adventure into the world of make believe and delight in the variety of furniture designs ready to fulfill your wildest fantasies. Designing the nursery – that once humble corner that worked as the guest room or home office must magically transform into a nursery with the help of luxurious, yet, magical baby furniture. Designing the nursery is a journey, a voyage into the world of baby cribs, changing tables and storytime art. One must choose baby cribs not just for their quality and practicality but for their grade on the whimsy meter as well. All the cribs, changing tables and armoires on Luxurylamb are guaranteed to exceed your expectations. And when there’s that knock on your door and your baby furniture arrives beautifully wrapped and presented to you, you’ll know that dreams do come true. Born from the desire to fulfill every little boys and girls dreams, Luxurylamb brings you a delightful collection of heirloom quality kids furniture. And not just beds and dressers and desks but magical kids bedding and art, as well. Just as fairytales are timeless, so are our Kids Furniture Collections. They’re designed with heart and passion and made to last and last. Just wait till you see our Kids bedding. Bedding is where kids snuggle and dream and it should definitely be the something they’ve always dreamed of. We have bedding sets designed with castles, dinosaurs, and even fire trucks. You and your child just need to dream it and we at Luxurylamb are here to create it. And as for Grandmas, Grandpas, Aunties and Friends, we have the biggest selection of Baby Gifts you’ll every find. From luxurious bassinets and cozy Moses baskets to imaginative toys, we have the baby gifts you’ve dreamed of. At luxurylamb we believe it’s not only the gift that’s special, if it’s a gesture of love then the gift giving is a cherished occasion all on its own.